Doors are a crucial part of every home, adding to a property’s energy efficiency and security as well its aesthetic appeal. 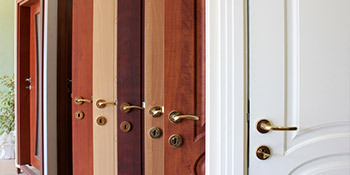 uPVC doors are one of the most popular choices for both external and internal purposes because of a range of benefits. You could need to replace a door for a number of reasons, whether it’s worn badly over the years or you’re simply redecorating your room. Whatever the reason, a sturdy uPVC door is seen as a fantastic replacement. With any door you want something that’s both sturdy and draught free. With energy efficiency now a priority amongst most homeowners, uPVC has shot to the forefront of the market with impressive insulating qualities. Doors provide energy efficiency, security and noise reduction to your home, so ensuring to get the right price is crucial. If you’re interested in a new uPVC door, complete our quick form and receive FREE quotes from up to four local, vetted and reputable companies. Project: Remove old door and for new front door. Project: The school house requires new rear door to be supplied and fitted. They did an excellent job, so good that I've called them back to do a second job. Prompt response from all recommended companies. Properties are given an energy rating dependent on how efficient they are and ratings are shown in the data underneath. This ranges from A, by far the most energy efficient, to G, the very least efficient. With a higher rating you're more likely to have less costly energy bills as more heat is going to be retained in the house. You'll be able to improve your home's efficiency with insulation including upvc double glazing, loft lagging or wall cavity insulation. There are many different types of home in the UK and the info beneath shows the type of houses in Uk. Over the country the most popular housing types tend to be semi-detached and terraced housing, but detached homes, flats and bungalows are also available. The information beneath offers an indication for the number of households in Uk which are central heated and non-central heated. Households are heated by a number of sources which indicate how pricey yearly energy bills will be. Examples of central heating include gas, electricity, oil, solid fuel and LPG boilers. Changing the way your house is heated could see you with cheaper bills. The data below illustrates the spread of properties warmed by various fuels. Throughout the United Kingdom the most common by far are gas heated properties, followed by electricity and then oil. Biomass boilers are also growing in popularity, heated by sustainable products like wood pellets or agricultural waste.|Homes in Britain are heated by a range of fuels, which include gas, electricity, oil, solid fuel and LPG boilers. Each fuel has a varying cost associated with it so you might find yourself with less expensive energy bills by switching how your house is heated. Even solar thermal panels are being considered by many people as a way to lower heating bills for the years to come.